Did you love riding a rocking horse as a kid? Do you want to bring the fun back for your little one? There’s no doubt that a rocking horse is a symbol of childhood. But they’re better designed now than ever before. Now they can be plush, featuring different animals, and suitable for all ages. 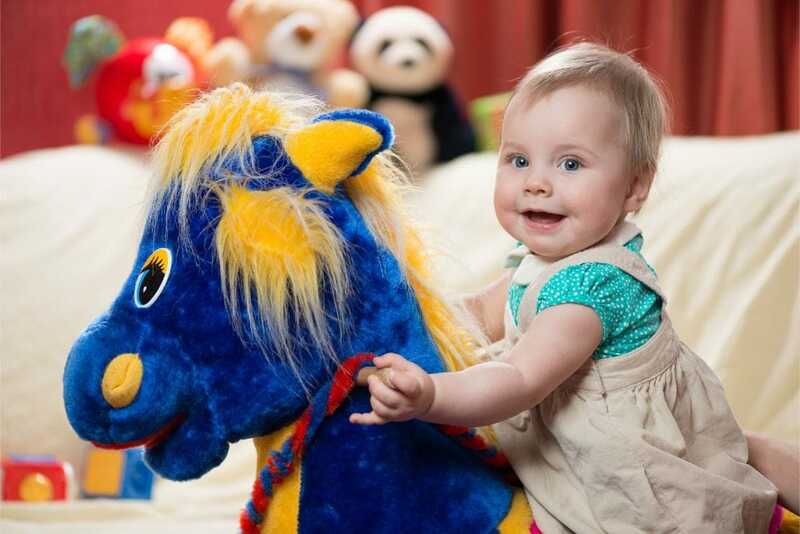 So, let’s have a look at why you should buy a rocking horse and what to look out for. We’ve also reviewed a bunch of our favorites for you to enjoy. 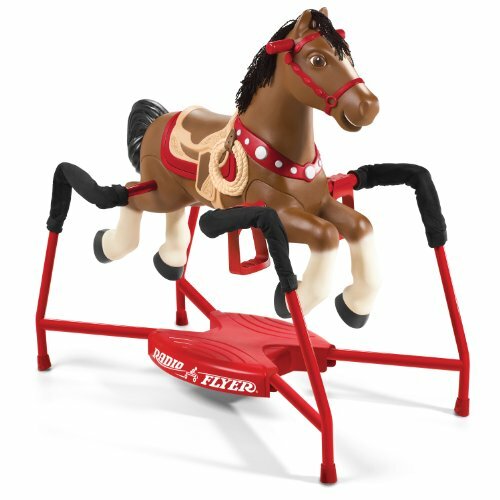 Use the links above to check the latest prices or read our in-depth rocking horse reviews below. Why Should You Buy a Rocking Horse? Using the leg muscles and core for balance and to improve mobility. The rocking movement can have a soothing effect (source). We’ve created a short list of things to look out for so you can choose the best rocking horse for your child. It’s important for the rocking horse to have a stable base. This is for safety, allowing a rocking motion without your child tipping it over. For this, wood is going to be your best bet, although some plastic models do have safety features, too. Everyone wants their child to be safe while they’re having fun. So, look out for extra security features. Some have a seat belt that wraps around their waist. Others have a saddle feature for added comfort and support when your child is rocking away. Now that you’re aware of some features to keep in mind, let’s have a look at our favorites on the market. We hope you find one that’s just perfect for your little one. 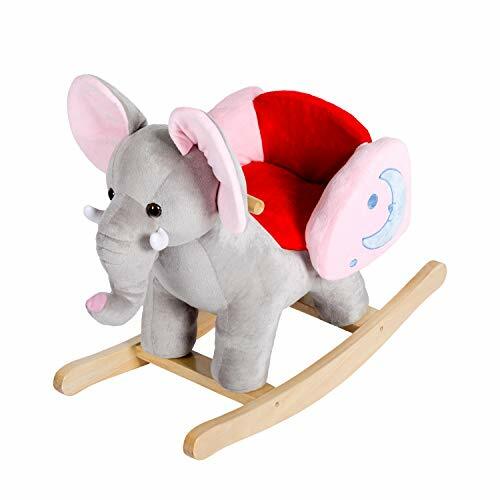 If you’ve got a young toddler, you may want to consider this fantastic rocking horse. It comes fully assembled for instant fun. We love that its plastic construction is easy to clean. It’s also ideal for using indoors and outdoors. The seat has a high back to stop your child falling backward. It’s also got handles and a high front so they can’t lose their balance. Let your princess go on an adventure with this colorful pink unicorn. 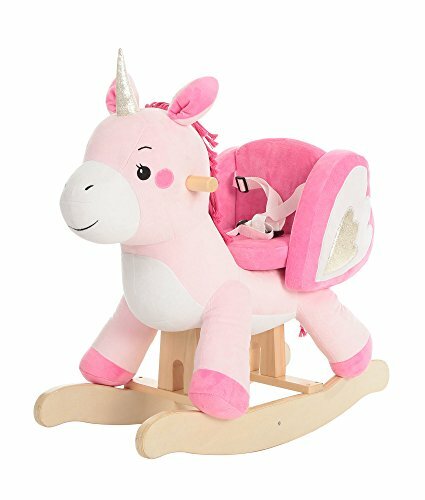 The unicorn is plush, with the base made from durable wood. With embroidered details and seat accessories, the company didn’t miss the realistic touch. Your child can feel supported, with wooden handles to manually rock back and forth. If they prefer other animals, they can choose from a giraffe, lion, and more. This award-winning rocker is sure to be a win for any little princess. 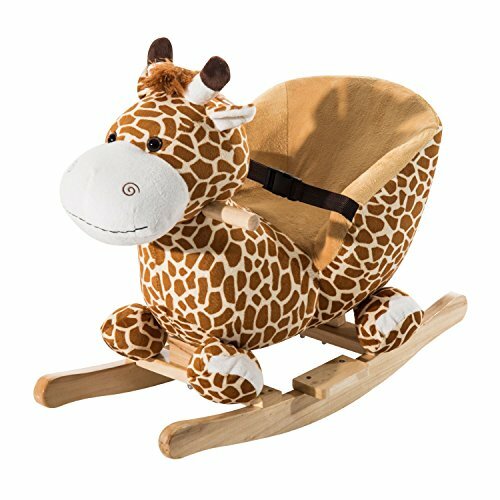 It’s ultra soft and has a sturdy construction with a durable wooden rocker. Your little one can sit up on the well-padded, three-sided seat, and a safety belt is also included. The plush fabric is even stain-resistant in case of accidents. The sweet accents on this rocking horse are just too cute. 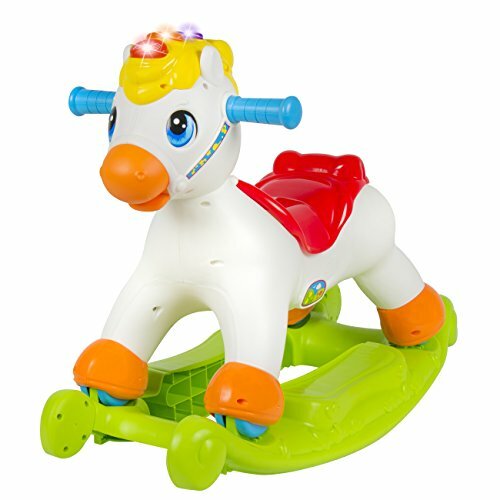 This is a fun, educational and sing-along rocking horse. It’s made from a durable plastic that’s easy to clean, and it has loads of cool features. Your child can press buttons to learn about numbers, shapes, and the alphabet. Plus, spinning the story wheel blasts cheerful music. There’s a storage compartment underneath the seat for the safekeeping of special toys. Furthermore, this horse can be detached from its base. It has wheels on the feet so your kid can scoot around the house all day. Patches is ready to ride, with a molded saddle for safety. There are handles to help your child stay upright. A favorite feature is its plastic construction. This makes it suitable for indoor and outdoor play, being easy to clean. It’s lightweight too, which is ideal for storage. There’s a sturdy wide bottom on this rocking horse so it won’t tip, even when your child goes “galloping”. Suitable starting from 1 year old. 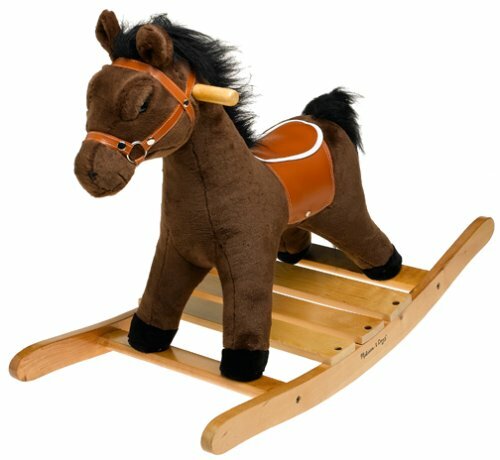 Champion is a rocking horse that encourages the imagination, making sounds and feeling soft to touch. There’s a carrot to feed Champion, who makes chewing sounds. There’s also a comb to brush the mane. The best part is that this is an interactive spring rocking horse. This means it responds to the movement. There are three riding actions: walking, trotting, and galloping. 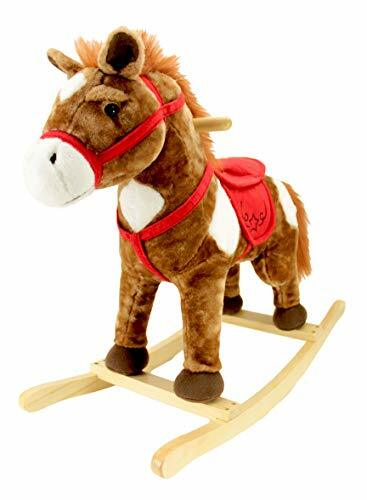 This rocking horse is solid, too, with built-in straps and a strong, sturdy base. Do you want to make sure your young child is safe while rocking? Check out this fun giraffe. It’s constructed from padded and plush polyester and has a chair to relax in. There’s a safety belt included. It has a wooden base for sturdiness and it’s easy to store and move around. We also love that your child can press the giraffe’s ear and listen to the song. This, combined with the gentle rocking movement, is sure to get them sleepy. If your child is young and needs support, this may be a fabulous rocker for you. The full seat has high sides to keep them upright, with a wooden frame all the way around. Don’t forget that you can soothe your child with the music. Just press the ear of the cute elephant and they can listen to the songs. There are other animals to choose from, including a crocodile, dinosaur, and more. One of the great things about this rocking horse is its super soft plush fur. It’s an adorably cute brown horse that’s all ready to ride with its saddle and bridle. It’s got a solid wood base that’s excellent for rocking back and forth. It’s also durable and can hold up to 150 pounds (yes, you read that right!). What’s more, it makes fun galloping noises. All kids have to do is press its ear and enjoy the adventure. For ages 2 and up. Now your little boy or girl can saddle up and take the reins with their own Appaloosa horse. 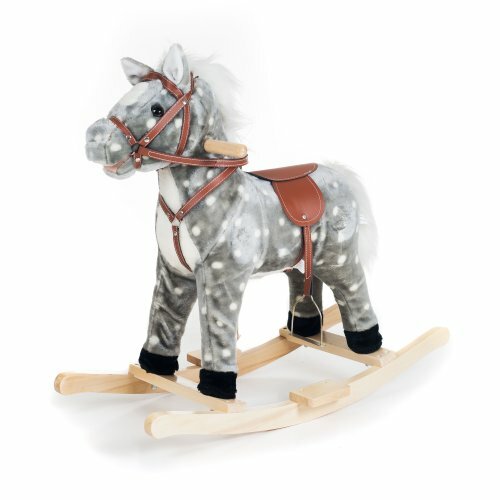 They can ride like they’re on a ranch, with this adorable grey and white speckled wooden rocking horse. It’s handcrafted with a wooden core and base, which is ideal for rocking. It’s not going to flip, and you can let your child rock away without having to worry. Age 2–3 years. 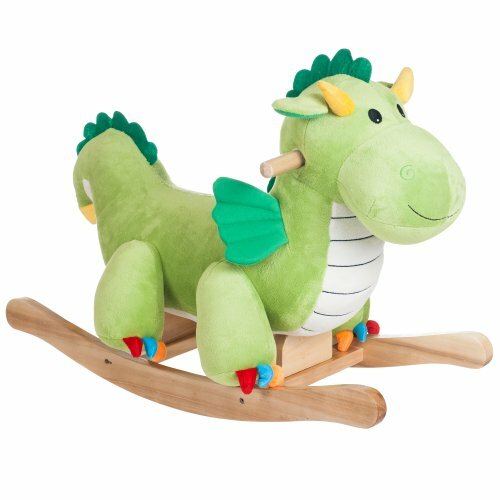 Let your child’s imagination run wild, riding this mystical dragon. Your little one can have fun making up stories. It’s made from polyester, with a pine rocker. There’s some balance required for this rocker, with a recommended age of 2 to 4 years old. It’s easy to climb on, though, and there are wooden handles to grip. 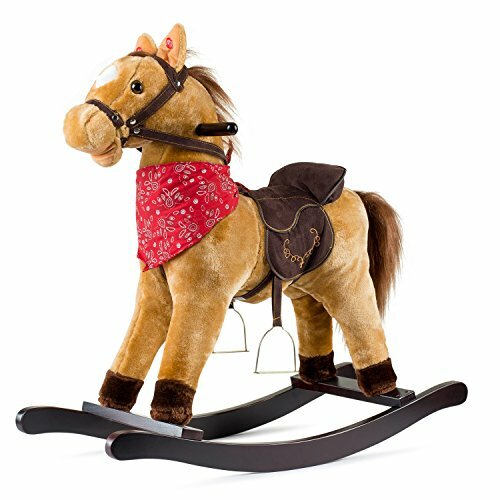 You can bring fond memories back to life for your kids with this traditional rocking horse. It’s suitable for children as young as 10 months, up to 3 years. 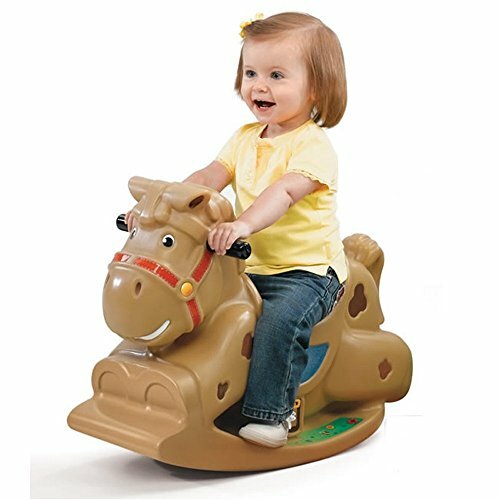 It’s constructed from quality wood and the base allows for gentle rocking or galloping. There’s a wide seat, accompanied by large handles to hold onto. We appreciate the safety features. The adjustable guardrail is great for babies, alongside the backrest that can be lowered as they get older. The plush fur of this rocking horse could be mistaken for the real thing! Your child can feel like a professional, thanks to the saddle with stirrups and the red bandana. They can also listen to the galloping and neighing noises when they press an ear. It has a solid wooden rocker and handles for a safe grip. Assembly required. 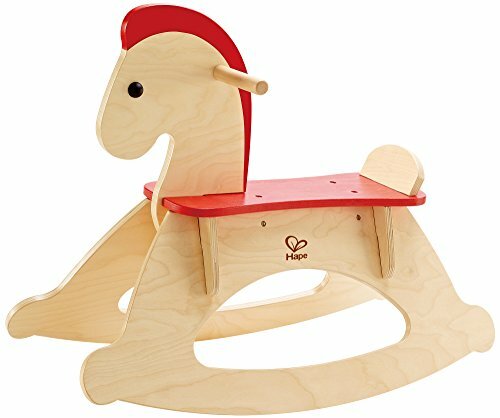 Rocking horses are a great toy for young children. They can bring out their most imaginative side and be soothing at the same time. Furthermore, kids get to work on their balance and coordination skills. 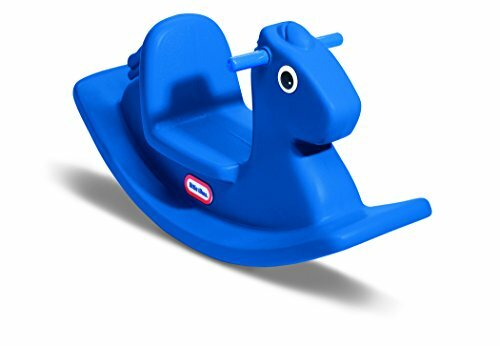 Our choice of the best rocking horse has to be the Little Tikes blue rocking horse. Its plastic construction makes it suitable for indoor and outdoor play, plus it’s easy to clean. The seat is also safe for young children. Do you have a favorite rocking horse? Let us know in the comments, and feel free to ask questions.